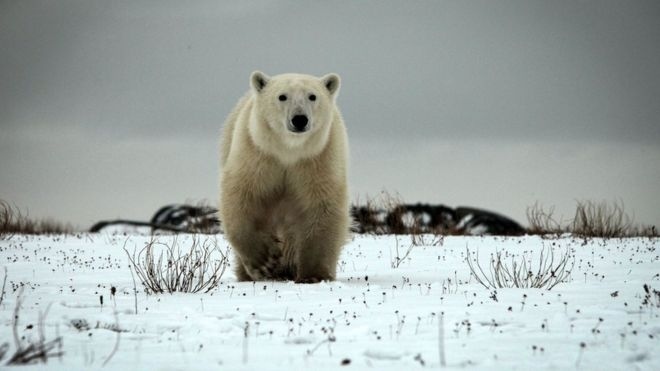 AKIPRESS.COM - A hunter has been killed in northern Canada in an attack involving a polar bear and her cub, and two other hunters received minor injuries, BBC reports. The hunting party from Naujaat, Nunavut, an Inuit hamlet located on the Arctic Circle, were out seeking narwhal and caribou when they were attacked. Both the mother bear and cub were shot and killed following the incident. This is the second fatal polar bear attack in Canada's northernmost territory this summer. Naujaat Search and Rescue went looking for the men after they failed to return as planned on Thursday from their hunting trip. The two survivors of the hunting party were found off the shore of Lyon Inlet, about 100km (60 miles) east of Naujaat. They had been blocked in by sea ice that was making it dangerous to navigate out to open water and leave the area. They also had mechanical issues with their boat. The Royal Canadian Mounted Police in Nunavut and the coroner's office are investigating the incident and have not released more details about the attack. It is not clear whether the mother bear and cub were killed by the hunters, or if they were destroyed by the authorities. The CBC reports three other bears were also killed in the following days after they were drawn to the location. The Canadian Press reported that the two surviving injured hunters huddled for three days with the body of their friend, staying awake waiting for rescuers as several other bears circled their camp.